Truth Action Ottawa went to the Willie Nelson concert in Ottawa April 7th 2009 to show their gratitude to Willie for going public with his doubts regarding the official 9/11 story. They handed out dvds of Willie Nelson’s intereviews regarding 9/11, and songs. They distributed over 300 dvds. 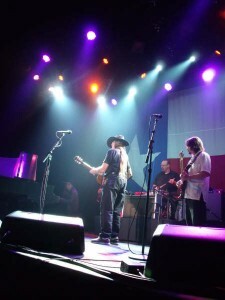 Willie Nelson and Family, at the Fillmore. Thanks to Janis, from Texas, for this picture she took. Always on our minds? Not always, but this legendary singer is very frequently, and definitely every time we think about beautiful, Texas-twangy ballads about love and the road and making it all work. Willie Nelson, who celebrated his 75th last year, is quite an artist, lending his songwriting talents to other legendary singers, his acting chops to the movies, his wise political takes to the public discourse, and his love of the earth to his efforts toward finding cleaner fuel. 1. Writing “Crazy” — yep, the “Crazy” made famous by Patsy Cline — which is a gorgeous, slow, painful song that makes everyone sad, but a happy-sad. 2. 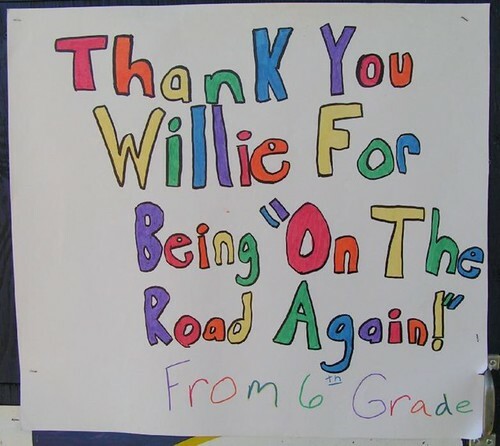 His support of “Bio-Willie” fuel for big trucks, a planet-nice way to gas up the tank. It’s made of vegetable oils, and Willie doesn’t mind going on TV to talk it up. 3. Setting his own trends with the braids and colorful headscarf he became famous for, especially back around the “Honeysuckle Rose” era. So Willie. So outlaw. Love it. 4. There’s a Ben & Jerry flavor named after him (Country Peach Cobbler). Okay, this is something that Ben & Jerry’s created, but still, if you’ve had a flavor named after you, you’ve reached a pinnacle in this world. 5. The LiveWillie.com wristbands, an up-to-the-moment, nice-to-the-fans way to hear Willie’s recent shows. Hmm, I think I’ll call the principal, see what’s going on with it; he told me the equipment was scheduled to be delivered.Â It’s probably buried under snow. 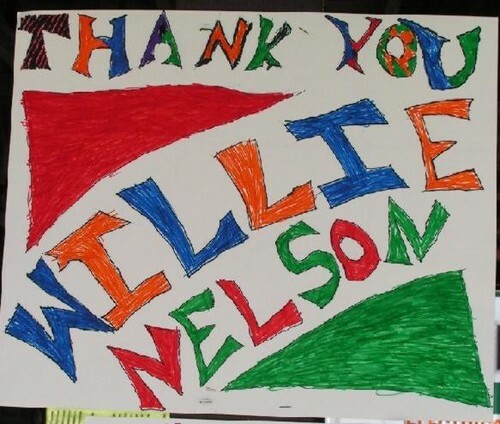 Here’s another poster created by the grateful students of Peru Catholic School, in Peru, Illinois.Â Willie Nelson and Family played a benefit concert to help the school buy playground equipment.Â This is one of hundreds of cards and posters given to Willie. 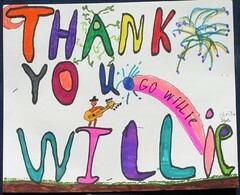 This is one of the hundred or so cards given to Willie Nelson by the students at the Peru Catholic School, in Peru, IllinoisÂ The students wanted to thankÂ Willie Nelson and Family for performing a concert which helped raise funds for playground equipment for their school.Â To seeÂ more cards, click on the hand-drawn picture of Trigger, in the upper right hand corner. Willie toured the United States, Canada,Â Scotland, Ireland, England, and The Nederlands. On January 12th and 13th, Willie Nelson joined the Wynton Marsalis Quintet for four sold-out shows in NYC, organized by Jazz at Lincoln Center.Â The show, billed as ‘Willie Nelson Sings the Blues’,Â wasÂ broadcast on the radio, andÂ you can hear the entire concert atÂ Wynton Marsalis’s website, www.wyntonmarsalis.org.Â AÂ friend sent me a copy, andÂ it’s beautiful; they are all such amazingly talented artists.Â Â Really,Â Willie couldÂ have a successful career singing rhythm and blues, exclusively. Performed at indie festival Coachella on April 29th, and at its country/bluegrass spinoff , Stagecoach, on May 5th. 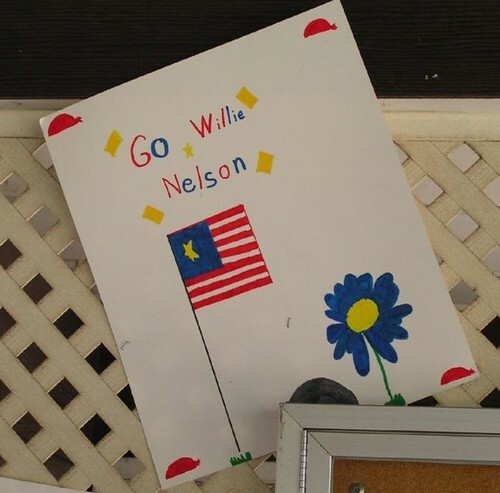 Willie Nelson and FamilyÂ performedÂ at the Gorge Amphitheater in George, Washington on the 4th of July, along with some alt country rockers:Â Â Son Volt, Old 97â€™s, Drive-By Truckers and Amos Lee. Farm Aid 2007:Â A HomeGrown Festival, on Randall’s Island, NYC, September 9th, with Neil Young, Dave Matthews, John Mellencamp and a cast of thousands. On September 10th, Willie andÂ some family stayed an extra day in NYC, and performed at the Hard Rock Cafe Ambassadors of Rock Festival, with proceedsÂ to benefit the Sustainable Biodiesel Alliance, co-founded by Annie Nelson.Â The festival was hosted by Woody Harrelson. Performed at theÂ Big State Festival in College Station, Texas,Â featuringÂ 40+ other country music acts, on October 14th. 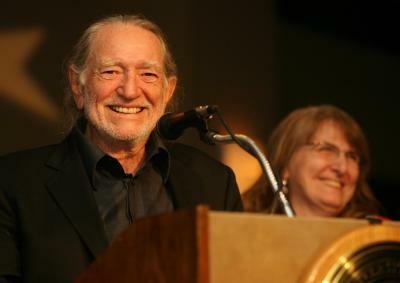 Willie was honored with the BMI American Icon award on December 6, 2007, in Nashville.Â On hand were Kris Kristofferson, EmmyLou Harris, Jessica Simpson,Â Sheryl Crow, Nicole Kidman, Carrie Underwood, Vince Gill, andÂ Willie’s families and friends, and fans.Â Â CMT.com reports that Nelsonâ€™s Maui neighbor Kristofferson gave perhaps the most heartwarming tribute before he and Emmylou brought the house down with a duet on â€œTil I Can Gain Control.â€Â Â I hope somebody filmed that night, and I get to watch it sometime. Willie was honored on 10/19/07 with the ‘Bridging Divides’ award, for his visionary aid to peaceful conflict resolution, at the Frank Erwin Center on the University of Texas campus. His children (except Lukas, away at school, I think) all sang ‘Peaceful Solution’ to their father, the song inspired and written by Willie and daughter Amy. Ben and Jerry’s named a new flavor in honor of Willie: Willie Nelson’s Country Peach Cobbler, and are donating a portion of profits to Farm Aid.Â Willie appeared on the Stephen Colbert Report, for a taste test of his flavor against Colbert’s Americone Dream flavor.Â Ambassador Richardson was called in to mediate, and then everyone joined Willie for a lively ‘On the Road Again.’Â The show is available for sale, on Best of the Colbert Report DVD. 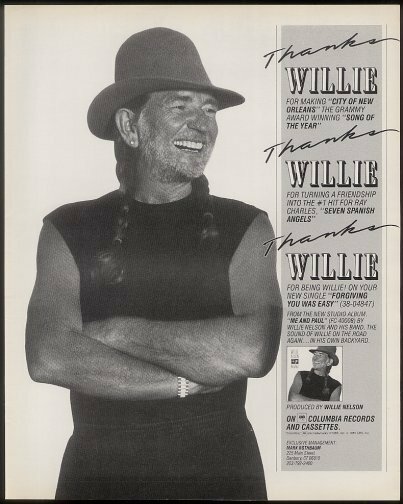 On November 1, 2007, Willie was honored with a Lifetime Achievement for Songwriter, by the American Music Association, at its 6th annual honors and awards, at the Ryman Theater, in Nashville. 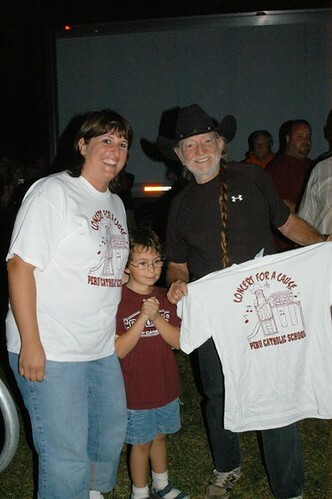 Willie Nelson, Larry Butler Johnny Gimble, & Cindy Walker were voted into the Central Texas Music Hall of Fame. The awards were presented on March 29th, at the Heart of Texas Coliseum, in Waco.Â I think Willie was on tour, and could not attend in person. Â Â Â The Willie Nelson PeaceÂ Research Institute launched in April 2007, as a portalÂ of inspirationÂ for living peacefully in the world. The site has links and informationÂ about how others are finding ways to live in peace, and actions they are taking to end war in the world.Â Also,Â through the site, Willie and Amy Nelson offered the song they wrote, ‘A Peaceful Solution,’ to any person to record and share at the site, and have posted the video tapes and recordings at the site for everyone to enjoy. Â Â Willie joined his family members and others in speaking out against horse slaughter in the U.S., and encouraged passage of the American Horse Slaughter Prevention Act.Â Taking it even further, Willie adopted horses that were going to be killed, and is raising them on his ranch. 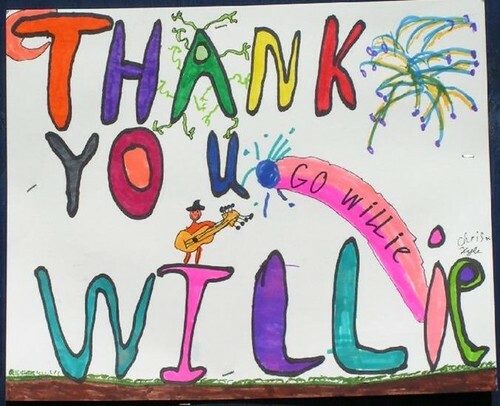 In December, Willie donated $40,000 to the town of Vancouver, Washington, a town where he once worked as a disc jockey, and self-produced a record that he sold to fans, before moving to Nashville. Â Â Willie filmed a Public Service Announcement which aired in Georgia, against dog fighting, and seeking strongerÂ anti-dogfighting laws and enforcement. narrated â€œHidden Kitchens of Texasâ€ radio show on National Public Radio. There’s so much more, but I wanted to get this done by the end of 2007, so I have to quit! Happy New Year Willie Nelson, Family, Fans and Friends.Â I wish you all the best in 2008 and that your dreams all come true.Â Be nice to each other, and yourselves. Hope to see you at a concert soon! 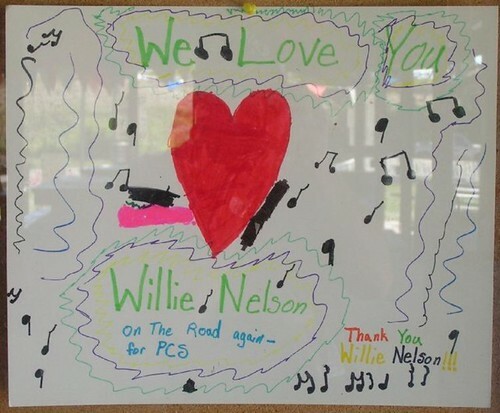 This is another of the many cards and posters made by the children at the Peru Catholic School, in Peru, IL.Â The kids wanted to express their gratitude to Willie Nelson for performing at a fundraiser held to benefit their school — build a playground, in fact.Â There’s a link on the right, if you want to see all the cards. 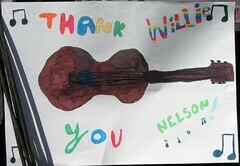 Another thank you note from the students of Peru Catholic School given to Willie Nelson, for his concert to benefit their playground.